Address: Teide, 35, Puerto del Carmen (Lanzarote), Islas Canarias. 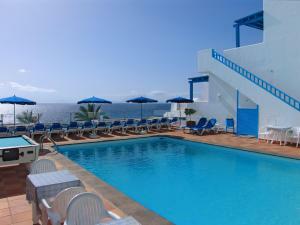 Rising within the old fishing village of Puerto del Carmen, overlooking the harbour, the coastline and Fuerteventura, this hotel is in the warmest and most charming part of Lanzarote. The apartments are favourably located just 30 metres from the sea in the heart of the old village, where you can enjoy a nice area where you can enjoy a good selection of bars, restaurants and a supermarket. When you are not exploring the town or relaxing on the beach, you can take a refreshing dip in the swimming pool and or lounge under a parasol on the 2 sun terraces overlooking the port. Please inform Apartamentos Agua Marina in advance of your expected arrival time. You can use the Special Requests box when booking, or contact the property directly with the contact details provided in your confirmation. Reception opening hours: Monday to Saturday: 09:00-14:30 and 15:30-21:00 Sunday: 16:00-21:00 If you expect to arrive outside reception opening hours, please inform Apartamentos Agua Marina in advance. You can use the Special Requests box when booking or contact the property. Please note that the name of the credit card holder must be the same as the name on the reservation.